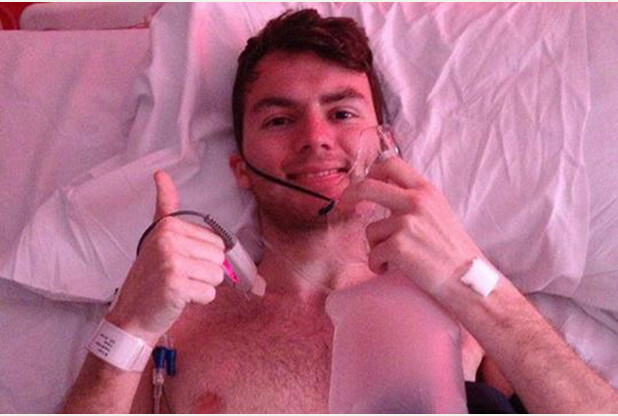 Inspirational teenager cancer sufferer Stephen Sutton. The ‘Big C’ they used to call it. Once you’d been diagnosed that was it. It was just a matter of how long you had left before the disease took you from your loved ones. Cancer still retains that aura of dread but with each passing year the reputation of this indiscriminate killer diminishes a little. This week’s news from Cancer Research that half of people in England and Wales now being diagnosed with the disease will survive at least a decade is hugely significant and should give hope to millions of people. It is testimony to the wonderful work of scientists, doctors and researchers who have taken enormous strides towards confounding cancer since the dark days of the early 1970s when being given the diagnosis was seen as the end of the world. New treatments, earlier diagnosis and screening have all played a part in increasing the life-span and, crucially, the quality of life of those afflicted by cancer. All of this, of course, has been paid for by tireless fund-raisers who continue to underwrite these advances in medicine and treatment – often as a tribute to friends or family members who have been victims of the disease. It is this triumph of the human spirit which, in my opinion, is doing more than anything to chase away the spectre of cancer. Just look at the way the courage of cancer victim Stephen Sutton, struck down by terminal illness in his teens, has touched the hearts of people across the UK and even around the world. 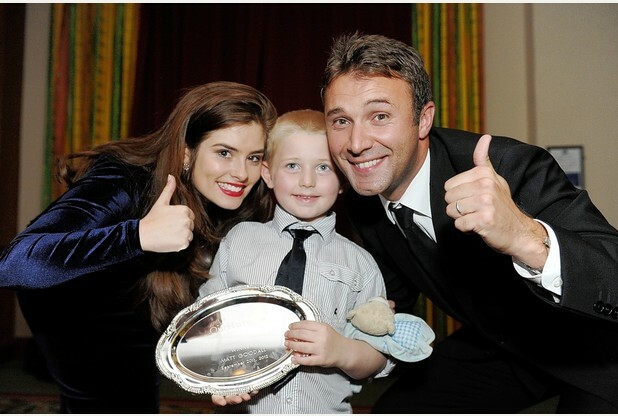 Stephen’s legacy won’t simply be the millions of pounds he has raised for the Teenage Cancer Trust. It will be a legacy of hope and inspiration for thousands of young people who find themselves in a similar, crushing, situation. Then there’s little Frankie Allen, from Burslem, whose beautiful smile as she battles leukaemia has prompted hundreds of people across the Potteries into action to show her she’s not alone. We’re with you ‘til the end of the line, kid. And what about Maia Handyside, from Stone? The 13-year-old’s bravery in telling her story in The Sentinel recently has brought into sharp focus the affect cancer has on young people – acutely aware of their own self-image. A couple of weeks ago a friend of mine – former Sentinel journalist Richard Firth – did something amazing. Together with my colleague John Woodhouse, he ran the London Marathon in aid of the Childhood Eye Cancer Trust (CHECT) in honour of his young daughter who was affected by the disease. I’m sure Richard won’t mind me saying that, like me, he’s not really got the build of a long-distance runner but nonetheless he completed this astonishing feat for his princess and I am in awe of him. This is that triumph of the human spirit I mentioned earlier. Last but by no means least, who could forget North Staffordshire’s very own Women Fighting For Herceptin – led by the indefatigable Dot Griffiths? Their fortitude in overcoming a postcode lottery and forcing the Government to make the cancer drug Herceptin available to all women who wanted it was a genuine game-changer which has enriched the lives of thousands of women all over the country. I could go on because there are countless examples of resilience shown by people affected by this most insidious of illnesses. The important lesson to learn from all these remarkable individuals is that remaining positive, no matter what the circumstances, is crucial – not only to your own well-being but to those around you. In August 2008 yours truly was diagnosed with thyroid cancer. My mum had spotted an innocuous-looking lump on my neck and forced me to go to the doctor. When I got the diagnosis I confess I went into panic mode. All I could think was that I wouldn’t live to see my children grow up and that’s a pretty awful prospect. I bottled up my feelings, made a will and steeled myself for the worst. The reality, however, wasn’t nearly so grim and I well remember the words of my consultant as he was explaining what would happen in terms of treatment. He said: “Cancer isn’t what it used to be.” He was right. I was lucky. I had a couple of operations and a course of radiotherapy. I now take tablets daily because I don’t have a thyroid and, as a result, face a constant battle with my weight. But it’s no great hardship really. I’m just glad still to be here writing this for you. Cancer never really goes away. Every time I see an advertisement for one of the cancer charities I have flashbacks to the moment I was given the news. I pray nightly that it never comes back and my missus gives a monthly donation to Cancer Research UK. I still visit the consultant once a year – in fact, I’m with him again next week. If I’ve learned anything (and this may sound ridiculously obvious) it’s that life – for as long as you have it – and the way you live it, is all that matters. I’m genuinely grateful for every day. Yes, even the ones when I have to get up for work at 5am or don’t finish ’til midnight. I’m extremely grateful for my family and friends. For my daft-as-a-brush dog. For the great job I have and the privilege of writing this column. For my geeky hobbies. For the places I visit. For my perennially-troubled football club. For the people I meet. For every night the kids keep me awake when they’re poorly. For every school homework project and parents’ evening. For every hug and every ‘I love you’. Cancer won’t be eradicated in my lifetime but with each passing decade the fear, pain and loss it inflicts will diminish and we can all play a part in that. Cancer isn’t what it used to be, you know. 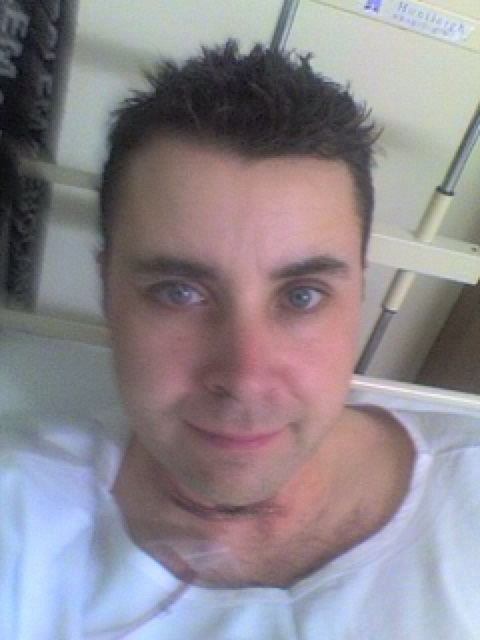 Yours truly having the operation to remove my thyroid. I wasn’t the least bit surprised when the consultant explained to me that I had cancer. It was my mum who spotted the innocuous-looking lump on my neck last July. Since then, at every stage of testing, when each one of the experts said that the chances of me having thyroid cancer were very small, I somehow managed to make the cut. I have been in that small percentage. However, being told the results of the biopsy still felt like an out-of-body experience. Then I drove home from the hospital, rang my gaffer at The Sentinel, sat down on the settee with our Yorkshire Terrier and wept. I’m not embarrassed to admit that, at 36, I had myself dead and buried. Thus I resolved to get my affairs in order. 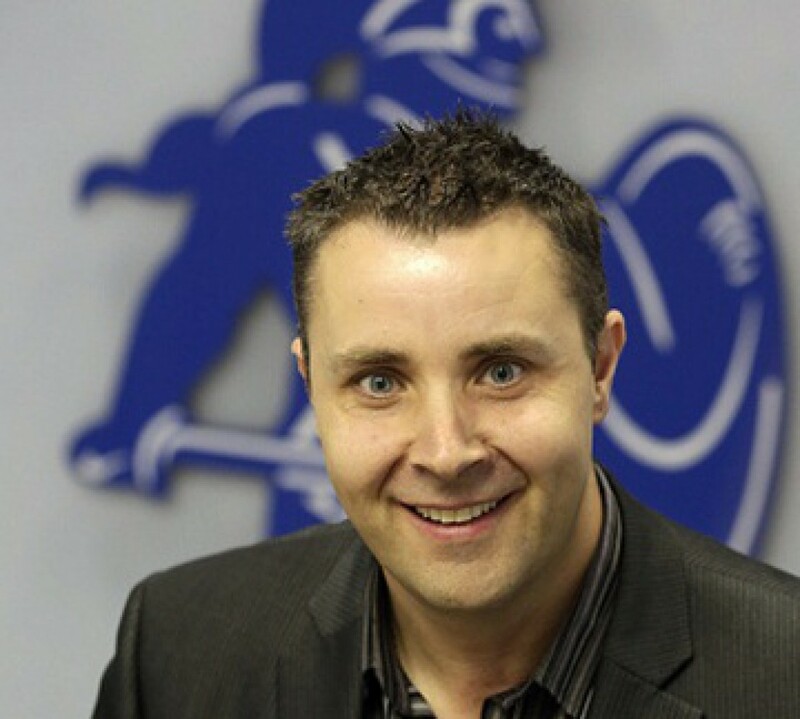 My priority was to make sure that my family were financially secure. I very quickly did what I should have done years ago and went out and bought a DIY last will and testament kit. I spent every minute I could with my children because I figured I was living on borrowed time. I found it hard to look at my girls without wanting to burst into tears. I just wanted to see them grow up. To say sleep was hard to come by would be an understatement. My brain didn’t want to shut down. Colleagues quickly realised I wasn’t just using up the time in lieu we hacks accrue for working daft hours. I didn’t try to keep the illness a secret. I couldn’t see the point. In contrast, I steadfastly refused to talk about the cancer with my nearest and dearest beyond the occasional ‘I’m fine’. If this was the beginning of the end I was determined I didn’t want to be remembered as the bloke who spent his last months mithering and being a burden to those around him. At least that’s the theory. In reality I continue to worry my loved ones to death by bottling it up. I had umpteen sets of tests and two operations. Then I saw the consultant who was to oversee the forthcoming radiotherapy. Like all his predecessors, the doctor spoke reassuringly, almost nonchalantly, about my treatment. I wanted to shout at him that I was really scared – that it was a huge deal. Couldn’t he look a bit more, well… bothered? But he’d been here hundreds, probably thousands, of times before. What to me seemed like the end of the world was, for him, just another pre-op appointment. And suddenly the penny dropped. Before that comment, I had this notion that I was slugging it out with the cancer. It was a fight I had to win because I desperately didn’t want to leave my family and friends. It was me against the cancer. Simple. But it wasn’t. It never had been. In the blue corner it was me, my family and friends, my colleagues and some wonderful NHS staff. In the red corner was the cancer. Suddenly I fancied the odds. I thought about all the amazing and inspiring stories I had written and read over the years. About the Women Fighting For Herceptin and their remarkable triumph over not just cancer, but the establishment that had conspired to deprive them of hope. I adopted the ‘there’s always someone worse off than yourself’ philosophy and suddenly I felt so much better. I’m not out of the woods yet… but I think I can see the tree-line.